I hope you noticed, dear reader, that contrary to my usual practice at ANZ LitLovers, I have not #NamedTheTranslator. That is because *drum roll* I have read this novel by French author George Sand in the original French. And after the first dozen chapters, I did not ‘translate’ as I read. I just read it, without worrying much about vocabulary I didn’t know unless it really seemed critical. (You can see for yourself where I stumble in my translations below). Moi, je crois que l’opinion politique d’un homme, c’est l’homme tout entier. Dites-moi votre coeur et votre tête, et je vous dirai vos opinions politiques. Dans quelque rang ou quelque parti que le hasard nous ait fait naître, notre caractère l’emporte tôt ou tard sur les préjugés ou les croyances de l’éducation. Vous me trouverez peut-être absolu; mais comment pourrais-je me décider à augurer bien d’un esprit qui s’attache à de certains systèmes que la générosité repousse ? Montrez-moi un homme qui soutienne l’utilité de la peine de mort, et, quelque consciencieux et éclairé qu’il soit, je vous défie d’établir jamais aucune sympathie entre lui et moi. Si cet homme veut m’enseigner des vérités que j’ignore, il n’y réussira point; car il ne dépendra pas de moi de lui accorder ma confiance. (Ch 14) Me, I believe that a man’s political opinions are the whole man. Tell me your head and your head, and I will tell you your political opinions. In whatever rank or whatever party it is our fortune to be born, our character prevails over prejudices or educational beliefs. You perhaps find me absolute: but how else can I decide to ascertain (?) a mind/spirit which attaches itself to certain systems that (makes) generosity flourish? Show me a man who supports the usefulness of the death penalty and however conscientious and clear-minded he might be, I defy you to ever establish any sympathy between him and me. If that man wants to instruct me in truths of which I am ignorant, he will never succeed; because he cannot depend on me to accord him my confidence. 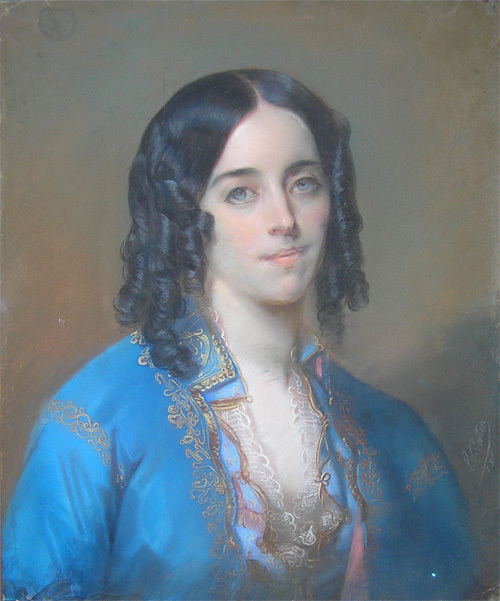 George Sand was the pseudonym of Amantine-Lucile-Aurore Dupin (1804-1876), a prolific French novelist who cast a sardonic eye over her society. She had a ‘liberal’ upbringing, and it was a liaison with the writer Jules Sandeau that prompted her to co-author her first published novel, Rose et Blanche (1831). Indiana was the first novel she wrote independently and she went to write an impressive string of novels, publishing two and three each year. (You can see them listed at Wikipedia.) Amongst her contemporaries, Baudelaire sneered at her, but Balzac admired her subtlety and imagery, and she was read by Dostoyevsky, Walt Whitman, Elizabeth Barrett Browning and Proust. More recently she is referenced by Virginia Woolf and by Elizabeth Allende, and in film, television and music. Anyway, Indiana suffers from an assortment of ailments which derive from her misery, and she cries a lot much to the irritation of Col. Delmare – but she still manages to look pale and attractive to her English neighbour Sir Ralph Who Loves Her From Afar. Although Indiana is on the lookout for love, she doesn’t countenance Sir Ralph and it’s hard to escape the conclusion that the sang-froid of Englishmen discounts them as potential lovers. (And George Sand should know about lovers, because she had a lot of them). Enter Raymon, (who we of Anglo-Saxon persuasion would call a Cad or a Bounder) and despite some hiccups along the way, (notably the suicide of Indiana’s maid and soul-sister Noun who fell pregnant to Raymon even as he swore his love to Indiana), he manages to steal Indiana’s foolish young heart. Having won her heart, he doesn’t want it. He sees Indiana take fearlessly to the horse that Sir Ralph so cunningly bought for her, and is a bit unnerved by her courage. He likes his women meek. (And rich as well, of course). Raymon fut effrayé de la voir courir ainsi, se livrant sans peur à la fougue de ce cheval qu’elle connaissait à peine, le lancer hardiment dans le taillis, éviter avec une adresse étonnante les branches dont la vigueur élastique fouettait son visage, franchir les fossés sans hésitation, se hasarder avec confiance dans les terrains glaiseux et mouvants, ne s’inquiétant pas de briser ses membres fluets, mais jalouse d’arriver la première sur la piste fumante du sanglier. Tant de résolution l’effraya et faillit le dégoûter de Mme Delmare. Les hommes, et les amants surtout, ont la fatuité innocente de vouloir protéger la faiblesse plutôt que d’admirer le courage chez les femmes. L’avouerai-je ? Raymon se sentit épouvanté de tout ce qu’un esprit si intrépide promettait de hardiesse et de ténacité en amour. Ce n’était pas dans le coeur résigné de la pauvre Noun, qui aimait mieux se noyer que de lutter contre son malheur. Ch 14) Raymond was alarmed to see her ride away like this, submitting herself without fear to the fiery spirit of a horse that she barely knew, launching him boldly through the shrubbery, avoiding with astonishing precision (adresse?) the springing branches that (might have?) whipped her face, crossing ditches without hesitation, confidently risking the slippery, muddy ground, unafraid of breaking her slender limbs, but brooking no rival (jalouse?) to be first at the steaming scent of the boar. So much determination alarmed him and almost aroused disgust in him for Madame Delmare. Men, especially lovers, are addicted to the innocent smug foolishness of wishing more to protect weakness than to admire the courage of women. Will I confess? Raymon was terrified by everything that a spirit so intrepid promised in boldness and tenacity in love. It was not like the resigned heart of poor Noun, who preferred to drown herself rather than to fight against her misfortune. C’est une grande imprudence d’introduire la politique comme passe-temps dans l’intérieur des familles. It is a great imprudence to introduce politics as a pastime in family life. This dissension bodes ill, and it’s no surprise that Sir Ralph’s relationship with the Colonel comes off worst. He has to do a lot of eating humble pie in this novel, (which probably gave French readers a certain grim satisfaction as Anglo-French relations were not at their best in this period). Indiana is a remarkably foolish young woman, who seems to irritate her creator. There are authorial gems along the way, like this one in Chapter 12. Ce n’était pas la première fois que Raymon voyait une femme prendre l’amour au sérieux, quoique ces exemples soient rares, heureusement pour la société. This was not the first time that Raymond had seen a woman take love seriously, although these examples are rare, happily for society. Luise, rival to Indiana for Raymon’s capricious attention, is much smarter. She understands that an heiress can’t hope for love, not when two million francs are at stake. She doesn’t blame Raymon, but she’s not silly enough to love him. She knows that French society requires that she marry, but she’s going to keep her independence for as long as she can, and she’s going to make Raymon work for what he wants. The reader can almost hear Sand chuckling to herself as her pen writes the scene where Luise mocks Indiana’s absurd histrionics. Woman is naturally foolish; it is as if Heaven, to counterbalance the eminent superiority over us men which she owes to her delicacy of perception, had implanted a blind vanity, an idiotic credulity in her heart. It may be that one need only be an adept in the art of bestowing praise and flattering the self-esteem, to obtain dominion over that subtle, supple and perspicacious being. Sometimes the men who are most incapable of obtaining any sort of ascendancy over other men, obtain an unbounded ascendancy over the minds of women. Flattery is the yoke that bends those ardent but frivolous heads so low. Woe to him who undertakes to be frank and outspoken in love! he will have Ralph’s fate. This is what I should reply if you should tell me that Indiana is an exceptional character, and that the ordinary woman displays neither her stoical coolness nor her exasperating patience in resistance to conjugal despotism. I should tell you to look at the reverse of the medal, and see the miserable weakness, the stupid blindness she displays in her relations with Raymon. I should ask you where you ever found a woman who was not as ready to deceive as to be deceived; who had not the art to confine for ten years in the depths of her heart the secret of a hope sacrificed so thoughtlessly in a day of frenzied excitement, and who would not become, in one man’s arms, as pitiably weak as she could be strong and invincible in another man’s. Well, almost. 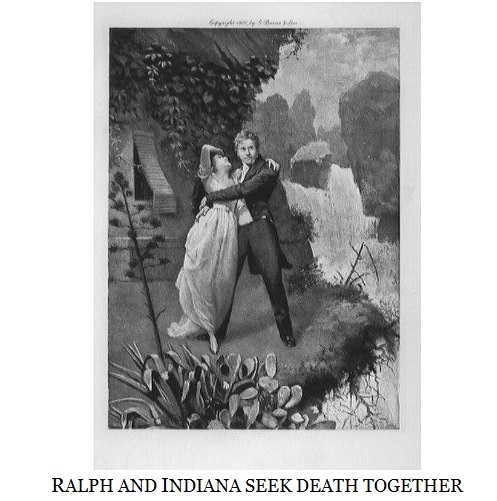 There is a nicely ambiguous ending to tease the reader: it could be that Indiana finds love at last and – consistent with her passionate nature – held his hand as they plunged to their deaths in the waterfall. But the last chapter, which takes the form of a letter to ‘J. Neraud’, suggests otherwise. An adventurer who has a slight acquaintance with Sir Ralph stumbles on an isolated cottage on the island. He had heard all kinds of fascinating rumours about Sir Ralph and Indiana but no one had seen them or knew what had become of them. Are the couple who are living contentedly there the reclusive scandal-makers, or are they the product of the letter-writer’s delusions after two days lost in a storm? A kind of prototype Choose-Your-Own-Ending, eh? BTW According to Wikipedia, Sand, who had never been to the French colony of Réunion, based her descriptions of the colony, on the travel writing of her friend Jules Néraud. 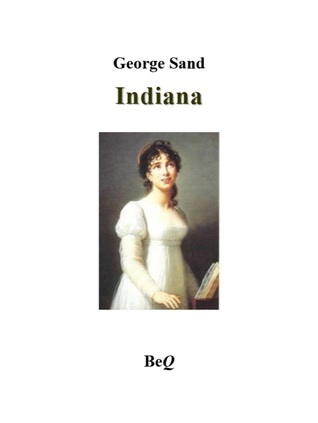 Also consulted Indiana by George Sand,The University of Adelaide Library. Kindle Edition. Translation by George Burnham Ives. PS The tables in this post have tested my skills with html and *pout* I could not get the cell padding right! Update 12/9/17 Crossposted at Sensational Sand, a collaborative blog devoted to the works of George Sand. Well done on reading the book in French – most impressive! I’ve read one Sand which impressed me and I do have another on the TBR – which I’m sure I will get to eventually! Congratulations, that is very impressive. Kudos for reading it in French, Lisa! I read it years ago in translation. It was a fun read. And thank you for your encouraging ‘likes’ as I logged my progress at Goodreads … I might have given up if not for thinking that I’d be letting the side down! Congratulations on reading in French – my recent attempt to learn French ended as all my previous attempts – in abject failure. I just get so bored learning how to say simple things, simpl ein English that is. Any advice? It must be nice to get to the stage where you can read a novel. LOL I am the last person you should ask for advice! My French journey is full of starts and abandonments. I start up again when a visit to France is in the offing, and I work very hard at it, and then I get back home and think, what’s the point? What’s helped this time has been the online Duolingo program, which nags me on my phone if I don’t practise every day. Maybe you could try that? I don’t know, I hate being nagged. :-) What would spur me on is the thought of reading Zola, Maupassant etc. in the original. But you cannot learn a language unless you practise it daily. A cheery little icon popping up on your phone to remind you is not a bad way to get reminded. Félicitations! Vous êtes très courageuse. Yes congratulations, and of course the next one will be easier. I still remember my youngest daughter getting to the end of her first ‘chapter book’. You’ve passed that stage and from now on it’s all down hill! Dad and mum used to holiday in New Caledonia so dad could practise his french, perhaps you could duck up there for the weekend. And congratulations for the cells too, I’m still struggling to get text to flow round my photos. Congratulations on reading it in French! I can’t comment on the novel, I haven’t read it. I’m not I’m a huge fan of George Sand as a writer. But what an interesting lady! PS: Lovely to see “bilingual” quotes on another blog than mine. I usually copy-paste tables from Word. They stay rather put. If you’re not satisfied with that, you can, copy-paste them as an image in a powerpoint slide and then record them in jpeg format and upload them as an image in WP. Sand is interesting, but also exasperating, if Indiana is anything to go by. She was not the only C19th female author to cast her heroines in a disparaging light, but I tell you, it really does focus the mind to translate pages of a silly girl’s love-struck rants. In English I would just scamper over those bits to get to the action, but I couldn’t do that in French… I’d get to the end of a paragraph, heave a great sigh, mutter something about ‘nothing having happened’ and then plod on! Oh well done for undertaking this in French- and finishing! I’m always impressed when I get through a picture book in French- without having to look up too many words..
LOL I wish Indiana had more pictures!